Today we continued to plant out the South Gully on our path to returning it to a Rainforest state. Weather and lack of rain have slowed us down a little, but with showers predicted for a few weeks we can get on with the planting. Today we were concentrating on the mid-section of the South Gully. This is the area that contains the (ephemeral)creek, the small waterfall, and is crossed by the path to Pet Cemetery. It is also the area where we have been battling the Singapore Daisy. 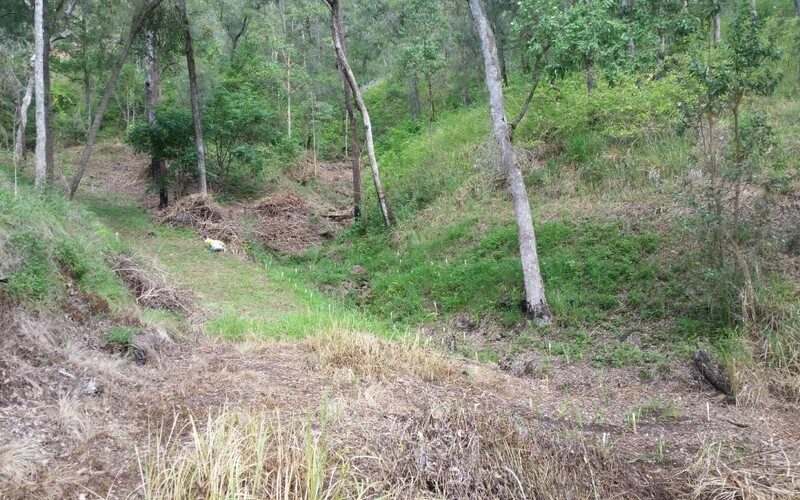 We had previously planted some Lomandra, and Blue Flax, and now wanted to extend those plantings to secure the creek bank and plant in the areas where we had removed Singapore Daisy. We added some further Lomadra hystrix, and also some Lomandra longifolia for some contrast. Path borders and creek banks were the main areas planted. We had to physically remove the remains of the poisoned Singapore Daisy, and it has proved to be as resilient as we had been told and had read. Small leaves of regrowth were present in many places, and green(live) stems covered the ground in a complex mat. Physical removal is the final part of getting rid of the S. Daisy, and it will be ongoing job to manage it and the regrowth. We don’t know where the S. Daisy came from, or if it was deliberately planted, but it is truly a problem for us and for the natural environment of the property. So no matter what you are thinking.. DON’T plant it .. anywhere!